Mozart in the Jungle deserved the Golden Globe. 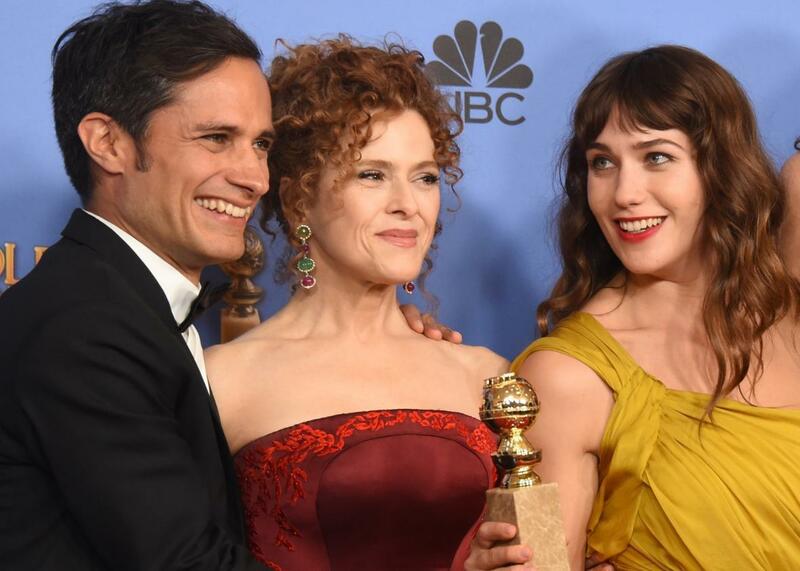 Actors Gael Garcia Bernal, Bernadette Peters, and Lola Kirke, winners of Best Series - Musical or Comedy for Mozart In The Jungle at the Golden Globes. But don’t worry: The whole thing is there on Amazon Prime for your classical music drama binging catch-up pleasure. And you should watch it, because Mozart is one of the most charming, quirky comedies out there. Oh, you already have a charming, quirky comedy in your docket? Perhaps you’ll be interested in the impressive, spritely production value, brought in no small part by the directorial involvement of Roman Coppola, Paul Weitz, and Jason Schwartzman (who also plays a bumbling classical music podcaster) and spot-on casting like Bernadette Peters as saucy orchestra management or a delightfully narcissistic Malcolm McDowell as the displaced—and far more popular with certain donors—conductor Thomas Pembridge. Seriously, everyone in this show is weird and good and after every episode I marvel to myself that it even exists in the world. Most of that marvel comes from how insanely precise and well-observed Mozart is about music and, more relevant for a comedy, the off-kilter personalities and peculiar challenges of the professional musical life. Take it from a former band nerd and music major: For all of the show’s dips into light surrealism (Rodrigo sometimes talks to an imaginary Mozart) and absurdist humor (the first chair oboist is treated to a Mozart stripper at her anniversary party), it is incredibly committed not only to the feeling of working in an ensemble, but also to making that lifestyle real. Union spats, intra-ensemble dalliances, soloists with big egos, and the emotional hold a teacher can have on a student—all of these are rendered in shockingly familiar detail, even as they are mined for humor. I’m sure Mozart isn’t for everyone—it’s a totally bizarre comedy about classical music, I get it. But for anyone who roots for unlikely heroes and hungers for specific details, it’s worth a shot. And it’s certainly worth the accolades it received Sunday night.